As high winds whipped dust, Siberian elm seeds and recycling bins around Albuquerque Thursday afternoon, dozens of people filed into the U.S. Bureau of Reclamation’s Albuquerque office to hear the agency’s 2018 forecast for the Rio Grande. Last year at this time, snowmelt was pouring down the river, flooding riparian restoration projects, filling out farm fields and even pressing against levees. This year, the lack of snowpack throughout the watershed’s mountain ranges has left the Rio Grande low and slow—and dry for 14 miles south of Socorro. Currently, the river is dry through the Bosque del Apache National Wildlife Refuge. “It’s fortunate we have those dams and reservoirs up there,” Faler said, referring to reservoirs in northern New Mexico that store water for the Middle Rio Grande Conservancy District and the Albuquerque-Bernalillo County Water Utility Authority. “That’s why we have them,” she said. But later this summer, the conservancy district’s water storage is expected to run out, as is Reclamation’s supplemental water. That refers to water the federal agency leases to boost flows in the river and protect endangered species like the Rio Grande Silvery Minnow. 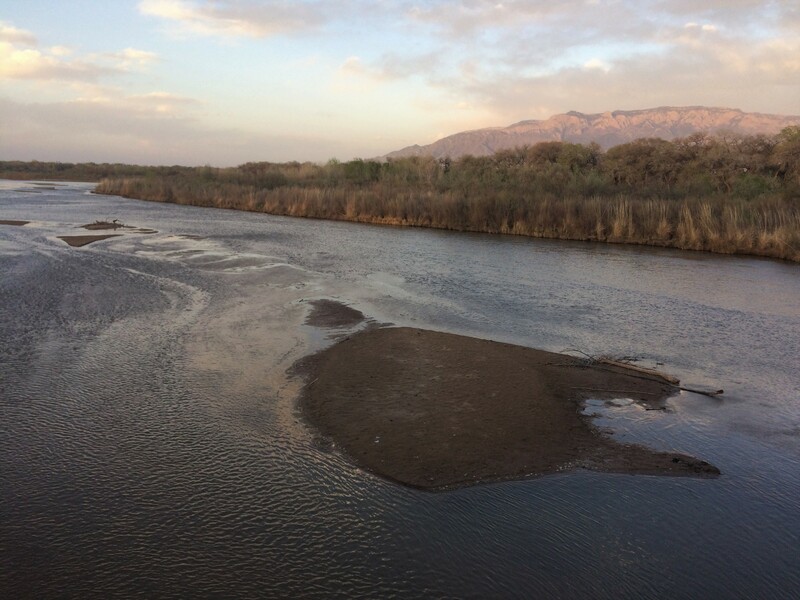 “We do expect to see drying in the Albuquerque reach this year,” Faler said, of the stretch of the Rio Grande that runs through the state’s largest city. During his presentation of the 2018 operating plan for the Rio Grande, which is compiled each year by Reclamation and the U.S. Army Corps of Engineers, hydrologist Ed Kandl offered additional details. In addition to the news about the conservancy district’s stored water, and Reclamation’s supplemental water, running out, Kandl said New Mexico will likely enter into what’s called Article 7 conditions on the Rio Grande by May. Under the Rio Grande Compact—the agreement under which Colorado, New Mexico and Texas share the river’s water—New Mexico is not allowed to store water in upstream reservoirs if Rio Grande Project storage is less than 400,000 acre feet in Elephant Butte and Caballo reservoirs. Reclamation’s Rio Grande Project supplies water to Texas, and also farmers in southern New Mexico. Kandl shared slides forecasting flows along the Rio Grande based on the winter’s snowpack analysis. Of the Embudo gage in northern New Mexico, he said, “We’ll be flirting with 100 cfs throughout most of the year.” Already this year, that stretch of the river has been running at less than half what it normally does. 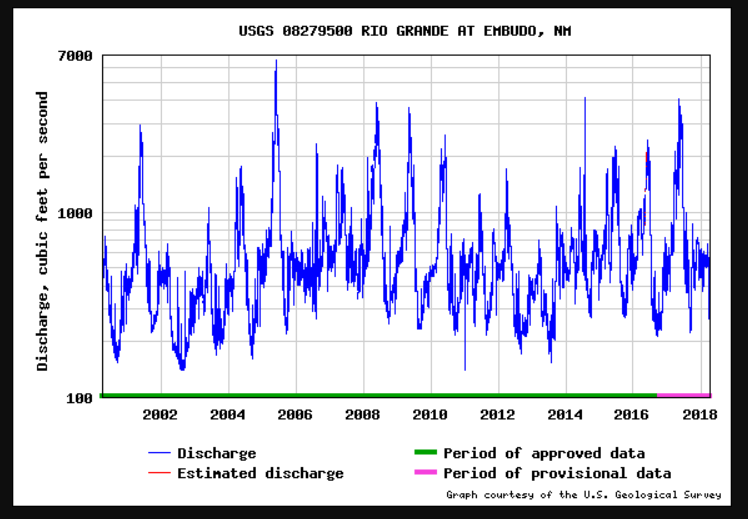 For perspective’s sake: water flows at the Embudo gage on the Rio Grande in northern New Mexico from April 2000 through April 2018. During that entire 18-year period, only occasionally dipped as low as 100 cfs. The “scariest” one, Kandl said, is the 2018 flows for the Rio Grande at the Central Avenue Bridge in Albuquerque, where the river will likely dry this spring and summer. Over the next several months, Reclamation will also begin working with its stakeholders to update a basin-wide study of the impacts of climate change on the Upper Rio Grande. The one “bright spot,” according to Reclamation officials on Thursday, is for rafters and recreationists on the Chama River. Because the agency will be releasing water from upstream reservoirs, the river’s flows will be good for rafting and kayaking.